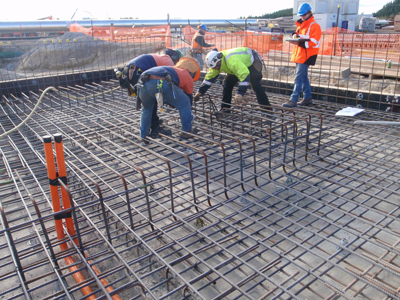 Onsite safety and innovation from the Fletcher Reinforcing Hamilton team - a key to the successful supply and placing of reinforcing steel at the Te Mihi Geothermal Power Project. The Te Mihi project being undertaken for Contact Energy is a $750 million programme of investments that safely and sustainably expands the use of the Wairakei steam field. It includes the construction of a new power station, development of the steam field to enable geothermal water to be reinjected, a bioreactor project to remove hydrogen sulphide from cooling water discharged to the river, life extension work at the Wairakei geothermal power station, drilling of production and re-injection wells and the development of people and business systems for managing the new assets in the future. The project is being delivered as a joint venture between McConnell Dowell, SNC Lavalin and Parsons Brinkerhoff who have joined forces to design and construct the project. Fletcher Reinforcing cut, bent and placed approximately 2100 tonnes of New Zealand-made reinforcing steel supplied by Pacific Steel. Placing was difficult at times due to the nature and scale of the project with many of the structures requiring Fletcher Reinforcing staff to work from scaffolding, adding complexity to an already complicated job. We offer bar chairs, safety caps, shims and heavy-duty circular spacers and more accessories. 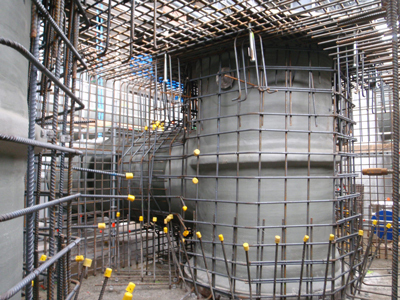 A complete range of both grade 300E and 500E plain, deformed and threaded reinforcing steel rebar.